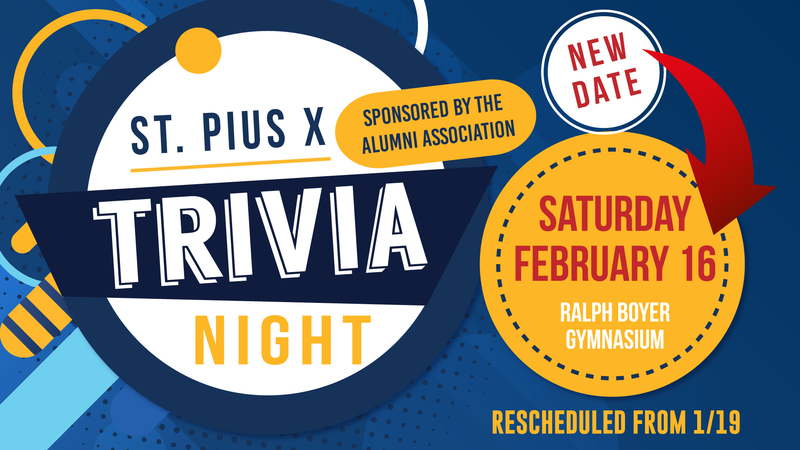 The St. Pius X High School Alumni Association is sponsoring their annual Trivia Night on February 16, 2019. If you're an Alumni Trivia Night regular, you know this is a fun event! If you're new to Trivia Night, join us and make it a tradition! Everyone is welcome! Doors open at 6 p.m. with Trivia starting at 6:30 p.m.
Each team is entitled to purchase one set of mulligans. Each mulligan will give you one free answer. Mulligans are not transferable among tables. Questions? Please contact Tina Fischer at (636) 931-7487, ext. 144 or tfischer@stpius.com.